For those who still believe that politics have absolutely nothing to do with our religion…please wake up before our freedom of religion disappears forever. After hearing that the invocation was going to be eliminated from the graduation ceremony at the Medina Valley High School in Castroville this weekend, I decided to take a drive to this little historic town. Christa and Danny Schultz sued the Castroville Independent District because their son, Corwin, was thinking of not attending his graduation due to the prayers that were going to be offered, as in the past, in front of the 2011 graduating class of 238. On Wednesday, District Judge Fred Biery of the US District Court for the Western District of Texas, located in San Antonio, ruled that the prayers at the graduation ceremony are unconstitutional and should be banned. Judge Biery was appointed by President William Clinton in l994. The lawsuit, Schultz vs Medina Valley ISD, was filed by AU Legal Director Ayesha Khan. It is almost unbelievable that this organization uses tactics of intimidation by asking for people to turn in prayer violators. The San Antonio attorney representing the Schultz’s is Donald Flanary of Goldstein, Goldstein and Hilley. This firm is noted for taking Liberal causes to trial. Texas Attorney General Greg Abbott with Chris Martinez, Assistant Superintendent of the Medina Valley ISD - The Schultz family who instigated the law suit with their son Corwin following behind. Chris Martinez, Assistant Superintendent of the Medina Valley ISD is being backed by Texas Attorney General Greg Abbott in appealing the court order. With only a few days before the Saturday, June 4th graduation ceremony little time is being allowed to perfect the appeal. Fields of corn are visible as you drive into town. In fact, there was a huge For Sale sign of 250 acres where corn is planted as far as the eye can see. Also, as you drive under a massive Medina Valley high school sign, fields of corn are part of the landscape along the short road leading to the high school. Crossing the bridge over the Medina River it is hard not to notice the quaintness of the town. It is also evident that the town has many of its small historic homes for Sale. Things are certainly changing in this small Texas town but prayer is not something citizens want changed. In case you have never been to Castroville, these photographs were taken during my visit to this charming town so that you can have a mental picture of what this town embodies. The population is more or less 3,000 plus. 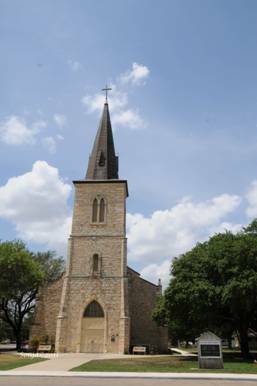 St. Louis Catholic Church, one of the first ten Catholic parishes in Texas, was established in 1844 is at the center of this town. Zion Lutheran Church followed in 1853. The St. Louis and Zion Lutheran cemeteries overlook the city and anyone driving past can not miss the distinct concrete monuments and crosses that litter the hillside. So how can this irreverent incident happen in a small town rooted in the Catholic and Lutheran faiths? 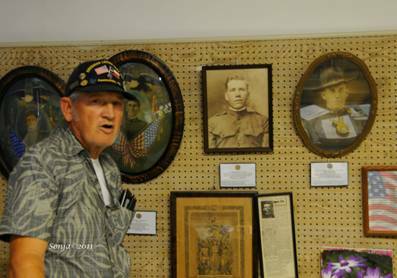 Albert King and Roy Clement from the local Weiss-Wurzbach American Legion Post 460 were absolutely against the ruling. Both Clement and King are Vietnam veterans of over 25 years each and King told me that, “there are no atheists in fox holes.” Jerome Iltis, the Commander of Post 460 served our country for 23 years in the Coast Guard and reiterated what Clement had said, “For God and Country that is our purpose.” He attended the hearing and found it to be extremely interesting. He did mention that before Judge Biery begun the court preceding he stated how he had just heard a case of a Medina Valley HS graduate who had been found guilty of defrauding a bank. Iltis felt this comment was totally inappropriate. The American Legion wasted no time in offering Roland Ruiz, President of the School Board, support in finding a solution to the prayer ban. The Mayor of Castroville, Bob Lee, told me he contacted Superintendent James Stansberry and offered his full support in overturning the ruling of banning prayer at the HS. He is very glad that Attorney General Abbott is working with the MVISD to fight the ban. It seems to me that this little town is uniting in their fight to preserve prayer in their high school. This prayer ban has rocked the small town but I doubt that the Schultz’s expected the town to fight back. One family should not be able to stop the prayers at the High School where the rest of the students want to continue the tradition. Don’t mess with small town Texas where they honor their war heroes for sacrificing their lives so that we can live free. No sir… don’t Mess with Texas. Where the Constitution No Longer exist in America! Like he said..." I will Fundamentally Change America"
you idiots that voted for him.....Thank You ! As a member of the Board of Directors of the San Antonio chapter of Americans United for Separation of Church and State, an organization the members of which you refer to as "anti-religious bigots", I encourage you to read the history and mission of AU on either the national or San Antonio chapter websites. Doing so would, I hope, dissuade you from an erroneous characterization of AU's founders and its purposes. There you will also find a description of the Settlement that was reached today between the parties in the Medina Valley case. That Settlement does not prevent a student speaker from praying at graduation ceremonies as long as it is done without School District involvement as outlined in the terms of the Settlement, which is available on our local San Antonion chapter website. AU is not anti-religious; we have well-known clergy on our Board of Directors, and at our First Amendment Celebration last year, we had ministers of various faiths participate in an open panel discussion. AU is opposed to governement involvement in religion, a doctrine embodied in the First Amendment and the principle upon which the Medina Settlement was reached. When we honor that doctrine, we honor all Americans, not just those of a particular religious sect or belief, and we make both government and religion accountable to their separate interests.